Thinking about adding a spa and a covered patio for the holiday season? Nine critical considerations. The best gift to give yourselves this holiday season could be an outdoor spa under a covered patio or pergola or on a deck or patio. A lot of my customers think about adding a spa to their outdoor project and I’d like to walk you through some of the things to consider the same way as I do with my customers. The first thing to do with a spa is to consider the size of the spa that you want. Are you getting a spa for you or you and your spouse to relax and unwind or are you getting the spa to use while entertaining? The most common spa sizes we put in are either 8×8 or 9×9. The next thing you want to think about is location. In real estate, the house location is most important. 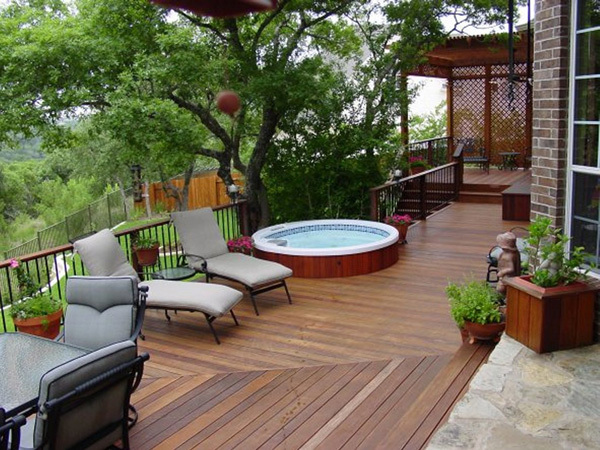 When building a spa deck or adding a spa or hot tub to your outdoor area, the same motto applies – location, location, location. I want to add just a couple more ideas about privacy walls. There are so many ways we can build creative privacy walls. You don’t need your privacy wall to be completely apparent. If you notice with the round hot tub above, the privacy wall is actually the natural trees behind the tub location. We built this into the deck design. In the featured picture at the very top, this family wanted the opportunity to decorate a wall based on the various seasons. In the summer they would hang greenery. In the winter, they would decorate according to the holidays. So using the cattle panel, they had this flexibility. Spas and hot tubs are not only for the colder months. You will enjoy your spa in the warmer months as well. Therefore, you want to think about sun relief. A pergola is often a nice option because you can enjoy the light of the sun but have a small amount of sun relief depending on whether you add a shield on top of the pergola. Based on my experience, an 18″ recess above the deck or patio level is a great height of the spa. What this allows is a place for you and guests to sit on the side of the spa, remove shoes, and swing your legs around to enter the spa. Another nice thing about keeping the height of the spa low is this generally keeps the protruding height of the spa below window sill level so the spa is not an eyesore from inside the home. You want to make sure to have at least a 4′ walkaround or possibly 6′ if you have a bench. You want to give you and your guests plenty of room to get into the spa and also to disrobe without having any safety or tripping hazards. One thing that I find is very popular is a cool-down bench. This is a bench that sits directly adjacent to and above the spa where people can sit and cool off while still dangling their feet in the spa. They can rest and enjoy a nice cold water or cocktail or just cool down before returning to the spa. When my customers are doing their research on which spa/hot tub to buy and where to buy it, I always tell them to do their research and I also share my research and experience. Each of the design consultants at Archadeck are free to recommend whichever stores they feel are best. After all, our reputation rests on our word, our designs, our build outs, our service, our TLC before during and after the build, our follow-up, and our recommendations. I take each of these tremendously seriously. As far as which spa/hot tub brand I recommend, I recommend Dimension 1 spas and hot tubs exclusively. I’ve worked with them exclusively for 8 years and I’ve never had one complaint, callback or service call. For a spa store in Austin, I’ve had the same luck with A-Tex spas here in Austin. Since I installed the first A-Tex spa for one of my customers 8 years ago, their delivery and service have been impeccable. I always do recommend though that you do your own research. 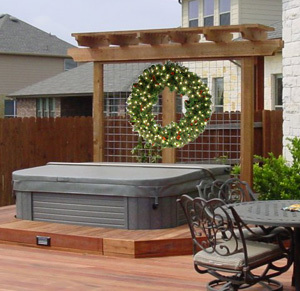 Once you select the spa you like, we take care of coordinating delivery and installation with your deck or other structure we’re building for you. Likely you plan on using your spa or hot tub for entertaining as well as for personal use. There will be some guests who can’t wait to jump right in. But you will have other guests who want to socialize with the hot-tubbers but want to socialize out of the hot tub. 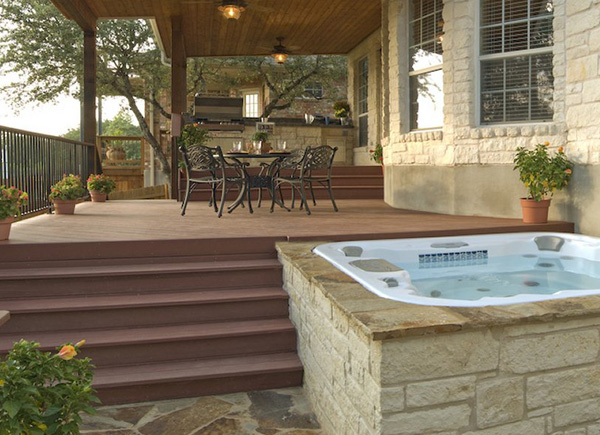 Create an easy place for your other guests to congregate and socialize with the folks in the hot tub. One great way is to build in a bar on one side of the hot tub. When doing your research and considering which contractor/builder for your job, I think the design phase will make it really clear to you who you want to go with. Is the contractor willing to come out to your home and review your vision with you to come up with creative ideas like using one of your prized trees as a natural or green privacy wall? Will they do a CAD design drawing of what your project will look like? At Archadeck, we do these drawings ourselves. They can easily take upwards of 6-8-10 or even 12 hours but we just can’t help ourselves but being excited when we hear your vision and come up with a way to translate that into design. Will your builder give you references to call of other customers? Does your builder offer a standard warranty? These are all questions and considerations as well. This entry was posted on October 10, 2010 by austinporchandpatio. It was filed under Hot Tub, Spa, spa locationo n deck, Water Features and was tagged with Austin Hot Tub, Austin spa, Dimension 1 spas and hot tubs, Green privacy wall, hot tub, spa, spa cool-down bench, spa pergola privacy, Tiger Wood decks Austin, tigerwood decks austin, Water features.